Here are this season’s Jewish/interfaith players in the National Football League. This list was prepared with the help of Jewish Sports Review and is current as of the date I wrote it (Sept. 23, 2010). David Binn, 38, long snapper, San Diego Chargers. Binn, a 2007 All-Pro, began his 17th season this year, but suffered a severe hamstring injury during his team’s first regular season game; he’s out for the season (placed on injured reserve roster). Binn is the son of a Jewish father and mother of another faith. He is secular, but told the Jewish Sports Review that he was happy to be identified as a Jewish player in the pages of the Review. Antonio Garay, Jr., 30, defensive end, San Diego Chargers. Garay has suffered a huge amount of injuries since his NFL career began in 2003. Injuries caused him to miss two complete seasons and, from 2003-2009, he played in only 14 games. However, he played in the first two regular season 2010 games, equaling his total for all of last year. Garay was the subject of a very interesting profile last January in the San Diego Jewish World. Garay was born and raised in Rahway, New Jersey, the son of a Jewish mother and a Catholic father of mixed Puerto Rican, Jamaican, and Costa Rican ancestry. His father, Tony, and his mother, Marsha, met at Hofstra University on Long Island, where both were college athletes. His mother was a softball pitcher and captain of the tennis team; his father was a top wrestler and football player. His father later went on to a short NFL career himself with several teams. Antonio was brought into a family of incredible diversity and love. Marsha Garay is devoutly Jewish, who taught Antonio and his siblings, brother Daniel and sister Francesca, from an early age about their heritage and the importance of understanding their religion. Of his mom, Antonio stated, “My mom is very proud, knows where she came from, and respects everything about her religion. Every holiday we celebrated, she explained the importance [of them] to us. Even though I am diverse, first and foremost, I am Jewish. It’s a big part of myself and my family.” It is an ambition of Antonio’s to visit Israel soon and wrestle in the Maccabi Games. Kyle Kosier, 31, offensive guard, Dallas Cowboys. This nine-year-veteran was injured in the pre-season and was expected to be out the first two games of the regular season. But he made a quick recovery and started the second game of the 2010 season. There’s still more to Olshansky’s story. He’s one of the few Jewish players in the NFL and, even though he says he’s not a strict follower of the Torah, he takes pride in his ethnicity. “It’s who I am, it’s my culture, my roots,” said Olshansky, who sports a Star of David tattoo on each side of his neck. “But I try to keep it separate from football. You see lot of doctors and lawyers who are Jewish but not as many professional athletes. So I think it’s good for the young, Jewish kids to have a couple of pro athletes out there.” Cowboys offensive lineman Kyle Kosier also is Jewish, something the two only discovered this past week during training camp. “That’s kind of cool to have a teammate share the same faith that I have,” Kosier said. It took a little while for the news about Kosier’s background to reach the mavens, like me, who follow “who is Jewish” in pro sports. Subsequent research by Jewish Sports Review disclosed that Kosier’s father is not Jewish, his mother is Jewish, and Kosier was raised secular and remains secular. Igor Olshanksy, 28, defensive end, Cowboys. A top player, he started 14 games last season and compiled his usual great stats. Olshansky is the son of two Jewish parents, as are Adam Podlesh and Geoff Schwartz, below. I have incomplete information about Erik Lorig, below – whether both his parents are Jewish. Adam Podlesh, 27, punter, Jacksonville Jaguars. He played in all 16 games last season and posted career-high numbers. Geoff Schwartz, 24, offensive tackle, Carolina Panthers. Schwartz was a 7th round draft pick in 2008, but was almost completely cut from the team during training camp. 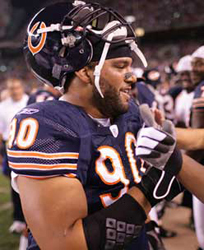 He hung on in 2008 as a member of the team’s practice squad. He made the Panthers’ regular team roster in 2009 and really showed his stuff?playing in all 16 games and starting three games that season. Sage Rosenfels, 32, quarterback, New York Giants. Rosenfels has been with a lot of teams in the last eight years, almost always in a back-up capacity. On Sept. 3, the Vikings traded him to the Giants, which could result in him getting more playing time. Rosenfels is the son of a Jewish father and a mother of another faith. My sense is that he identifies in a cultural sense as Jewish, but isn’t very religious. Taylor Mays, 22, safety, San Francisco ’49ers, and Erik Lorig, 23, defensive end, Tampa Bay Buccaneers. A college star at the University of Southern California, Mays is being “brought along slowly” by the ?49ers and is now playing on special teams. The son of an African-American father of another faith and a white Jewish mother, Mays has been the subject of several profiles and updates in this column dating back to 2007. He was raised Jewish and had a bar mitzvah. Lorig, a Stanford grad, was assigned to the Bucs’ practice squad. Both Lorig and Mays signed 4-year contracts with their respective teams. A new fun celebrity interfaith couple has emerged and appears to be getting serious: Jewish film director and actor Eli “The Bear” Roth, and writer, reality show star, and fashion model Peaches Geldof. Eli Roth, 38, is famous as the director of a slew of horror movies that have done well at the box office, including Cabin Fever and Hostel. He is also known for his acting work, including a role as a Jewish commando, Donny “The Bear Jew” Donowitz in Quentin Tarantino’s 2009 historical fantasy, Inglourious Basterds. It isn’t clear to me whether Roth was referred to as “The Bear” before the film. But, since then, gossip sources have often referred to him as the Eli “The Bear” Roth. Roth, who was raised Jewish, had a fairly conventional upbringing as the son of two Jewish parents (his father is a doctor; his mother, a painter). Peaches Geldof, 21, on the other hand, had a most unconventional upbringing as the daughter of Irish rock singer and humanitarian Bob Geldof. Anyway, Peaches and Eli have been quite the inseparable couple since they started dating in March, 2010. Roth has never been married and Peaches Geldof ended a one year marriage in 2009. There are unconfirmed reports that “P&E” are engaged. Earlier this month, the gossip world was all-a-twitter (pun intended) when a photo came out of Peaches celebrating Yom Kippur with her sweetie at Roth’s parents’ home. The photo was sent by Peaches to a friend who, in turn, posted it on Twitter. Peaches, as you can see if you click over, is wearing a skull cap (yarmulke) in the photo. What makes them a fun couple, besides their names, is that they are both really vibrant people who take over the space when they appear on talk shows or elsewhere. Despite their age difference, you can see how they would be attracted to each other. Next time in this column: yet more recently uncovered Jewish/interfaith actors in new TV shows and the odd deathbed conversion to Judaism of the most famous motorcycle stuntman driver in movie history.